In ‘Making It to the Board’, we answer the question of why there are so few women on the boards of organizations. Is this a lack of ambition, or a lack of skill? There are many books about women and men on the board already. This is the first book that goes into a deeper layer of the subject. The book is based on the first major qualitative study in the Netherlands in the field of diversity and leadership, consisting of 130 in-depth interviews with women and men on the board and at the sub-top level, focusing on personal characteristics. 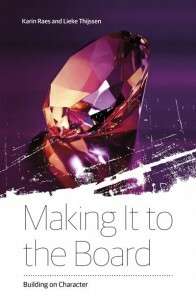 In ‘Making It to the Board’ we – among others – explain that the character profiles of people on the board differ distinctly from those of people in sub-top level positions, and that subconscious factors play a significant part in this. In this book, we provide advice and offer insights into what organizations can do to actually achieve diversity at the top more quickly. It combines practical examples with theoretic substantiation of what does and what doesn’t work within the framework of diversity in leadership. Character structures in women and men on the board that make the difference. The impact of their personal history and their family of origin in making it to the board and staying there. Shadow sides and pitfalls of female top executives on the basis of character structures. Dilemmas of women at the sub-top level: not wanting to, or not being able to. Advice for women, men, management teams and organizations. Best practices and examples from the interviews: what does work, and what doesn’t? General tips for diversity development. Current and future managers, boards of directors and management teams of organizations. This book is intended for women and men on the board (and those who aspire to make it there). They are the people who play a crucial role in the required change in terms of attitude and actions. They need to make that first significant effort and lead by example to achieve sustainable diversity development within organizations. In addition, the book is intended for women at the sub-top level who wonder whether they are willing and able to advance to the board and be successful there for part of their working life. We predominantly focus on companies and organizations with (inter)national ambitions to remain competitive, and organizations that are unable to make or keep their boards diverse, while the breeding ground for talent is becoming ever smaller, and the number of women in it is growing. With this book, we want to make a contribution to solving this social issue on a large scale. We recognize the importance of diversity for vital, sustainable organizations and a vital, sustainable society. A society in which there is room for everyone’s talents now and in the future.